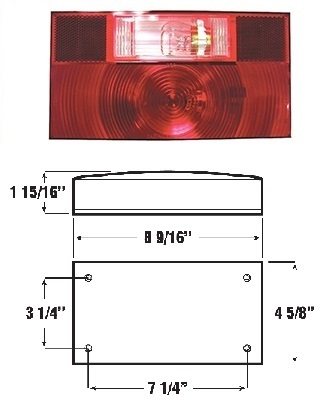 Radius style surface-mount red taillights. Acrylic lens. All include automotive corrosion resistant bulb sockets and 16 gauge supply and ground wiring. Meet and exceed DOT requirements. Designed for long life and easy installation. Designed for horizontal mounting only. 8-5/8"L x 4-5/8"W x 2-1/8"D. Replaces Bargman 91 Series.